I know I keep going back to this flavor combination, but who can resist chocolate and peanut butter? These peanut butter cookies are great plain, no frosting, but why stop? There is a layer of peanut butter frosting then topped off with milk chocolate frosting. Grab a glass of milk and enjoy! Preheat oven to 375°. In large bowl, cream butter, sugar, and brown sugar. Add egg and vanilla. In small bowl, microwave about 1/3 of the peanut butter chips at 50% power, just until softened, mix into batter. Add flour, baking soda, and salt. Stir in remaining peanut butter chips. Drop by cookie scoop onto cookie sheet and gently press cookie dough balls with bottom of a glass dipped in sugar, to about 2″ diameter. Bake 8-9 minutes, do not over bake. Cool on cookie sheet until set, about 2 minutes, remove to wire rack. Cool completely before frosting. Mix all ingredients with electric mixer until smooth. 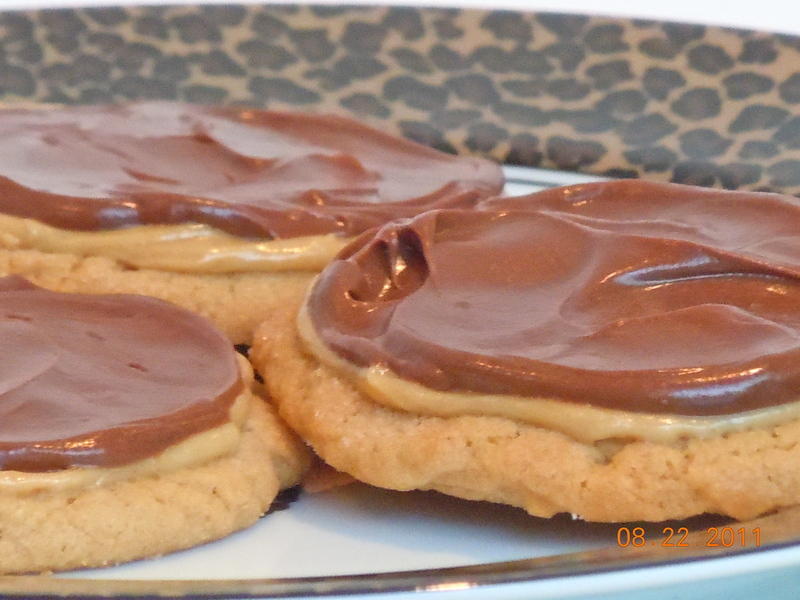 Frost cooled cookies with thin layer of peanut butter frosting. Frost second layer of frosting on cookies with your favorite milk chocolate frosting, or I used store bought (easier and still delicious). I microwaved the plastic tub of milk chocolate frosting at 50% for a few seconds to thin it a bit (careful…just a little bit). Put frosted cookies in fridge to help the frosting set up. Makes about 4 dozen cookies. You’re right–the best combination!! thanks for the post.